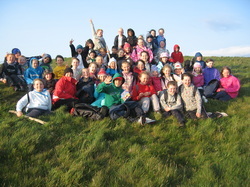 In Primary 6 we go on residential trips to Killowen and Shannaghmore Outdoor Education Centres. Pupils from King's Park have been going on these trips for over 15 years and this page will hopefully let you know a little bit more about what will be happening before and during your trip. In the first term all pupils in P6 will receive a letter with details about the trips. If you want to go on the trip you need to return the form along with a deposit to Mr Gray who is the trip co-ordinator. There is enough room for all pupils on the trip so don't panic about gettting money into school the next morning! All important dates will be included in this letter. We try to be as helpful as possible when it comes to paying for the trip - normally we ask for 3 payments: a deposit in term 1, a second payment after half-term in February and a final payment after Easter. When payments are made Mr Gray will send a receipt home to confirm it has been received. There will be a parents meeting 3-4 weeks before the first trip departs. The Big Day Arrives - What happens? Can I bring a mobile? No. We encourage pupils to leave their phones at home for the week. If parents/guardians need to be contacted, the staff will get in touch. We work on the assumption no news is good news. If you need to contact us in an emergency during the trip the number of each centre can be found on the information sheets sent home on the parent's evening or via the above links. Why do I need to bring carrier bags?